We’ve been looking at some of the biggest names and longest-running, most influential careers of the era in the past few weeks, so, something else this time. Edition #5 – Welcome the New Soul Vision: Dexys Midnight Runners. When it comes to pop music, time and public opinion aren’t always kind to auteurs who insist on following their vision at all costs, and things don’t always work out for bands taking chances at the height of their popularity. The career of Dexys Midnight Runners is a good example of these and a few other things that happened to more than one group in the post-punk period. One of the more unique (and lampooned) acts of the era, Dexys Midnight Runners began in Birmingham at the end of the seventies with Kevin Rowland, who, after trying his hand at a punk band, decided to put together something more in line with his taste for classic soul. 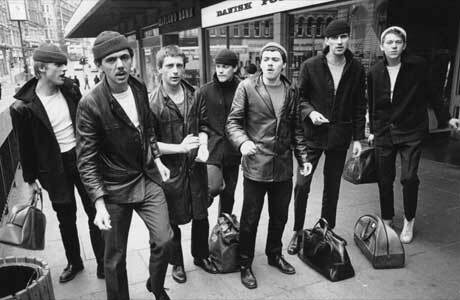 Dexys Midnight Runners, ostensibly, had nothing to do with punk, but they, like so many other groups of the era, could never have existed in the form(s) they took if it weren’t for punk and its effects. They are, furthermore, an example of two significant phenomena in the post-punk period: one being the discrepancies between recognition in North America and Europe, and the other being pop bands that subverted and challenged standards from within the mainstream. Regarding the first: Dexys Midnight Runners were only a one-hit band over here. In England, they were huge throughout the first half of the eighties. This is something that happened quite often, resulting in a number of groups who were popular in Europe getting tagged as novel one-hit-wonders in North America. And, regarding the second: there were a great number of new groups who got caught up in the mainstream pop current in the post-punk years and transplanted some of the punk ethic there, oftentimes without anyone ever realising it. The career of Dexys Midnight Runners begins and ends with Rowland. He was the frontman and songwriter, arranger, spokesman and visual co-ordinator for the band. He was the leader of the band in every sense, and, as is often the case with such figures, he was an inspired, but difficult character. From the very start, his vision for the group guided them into much acclaim, which always seemed to be followed, however, by momentum-stopping decisions, in-fighting, and disbandings. The band made an impression right from the start, with their first record, the Dance Stance single in 1979. Even bigger was their next single Geno, in 1980, which was a number one hit in England. By that time, the group had a contract with EMI and were working on their debut LP, Searching For The Young Soul Rebels, which was released later that same year to much acclaim. The band were really cutting a path through the British pop scene at that time, with their co-ordinated outfits and their sound and stage moves that harkened back to 60s soul, but, at the height of their popularity, Rowland insisted that the next single was to be “Keep It Part Two (Inferiority Part One),” against the wishes of nearly everyone involved. It went ahead though, and, as his band and label people predicted, it bombed. At that point, most of his band walked out on him, citing this as the last straw for enduring Rowland’s demanding, controlling behaviour. So that was it, one of the most successful new groups of their time, over and done within a year of their debut. Rowland soon got another lineup of players together though, and began work under new visual and, soon, musical aesthetics. For the remainder of 1980 and 1981, the new lineup, attired in what can only be referred to as some manner of athletic training image, played around a bit and released a couple of singles before going in a new direction. Taking cues from Irish folk, Rowland devised a new sound for the group in 1981 which shifted from the classic soul-influenced sound of the previous records and into a soul/folk hybrid. He brought in fiddle players and came up with the fairly iconic shabby overalls look that the band is most known for, a combination of 19th century British lower class and hillbilly clothes. The band recorded what was to be their most successful, and longest-enduring statement, the Too Rye-Aye LP in 1982 and went right back to the top of the charts. The first single “The Celtic Soul Brothers,” pretty much stated the band’s new direction outright, and was a hit, but the success went international with the next single, “Come On Eileen,” which, although followed up by another successful single in Europe, was the only time the group managed any success in North America, forever placing the catchy song and their peasant image in the halls of eighties one-hit-wonder nostalgia. After touring around and being one of the biggest pop bands on the planet for a short period of time, another departure of players occurred, and the remaining few members disappeared for a couple of years to work on a new record. When the band emerged again in 1985, it was under a new yuppie image, and with a sound that sort of continued on from Too Rye-Aye, but which owed more to studio work and hired players. Don’t Stand Me Down remains a contentious record, with some thinking it was the best thing Rowland ever did, and others thinking it was too full of itself. It was an anticipated record, but it wasn’t as accessible as their earlier efforts. To further add to its doom, Rowland refused to release singles from the record when it counted the most, halting the album before it even had much of a chance. That was pretty much as far as it went, too, as by later the same year the band was broken up. To the world at large Dexys Midnight Runners remain the “Come On Eileen” band, and to Simpsons fans, the band that the Be-Sharps beat out for their Grammy award. To British audiences, they remain a band that didn’t really go the distance they could have, and to those interested in the post-punk era, they remain an example of the new freedoms opened up in pop music at the time, and the new avenues for punk-influenced ethics. Rowland, ultimately, remains an example of how not to go about a career in pop music, but, it must be kept in mind, he was more or less pushed unwillingly into the industry game and fame was something he never really sought, as most of the decisions he made were according to his vision for the group, not what were the best moves at the time. With such a character at the helm, it’s unlikely that it could have gone any other way, as Rowland both made the band, and wrecked them. They had something working for them in the early part of the eighties, though, which, throughout an unsuccessful solo career, Rowland has never been able to repeat.